What is the Income Inequality Committee’s proposal to raise the minimum wage? If the Council approves the Mayor’s proposal to raise the minimum wage, low-wage workers in Seattle and our local economy will see significant economic gains. 46% of Seattle’s low-wage workforce, who work for large employers, will make $15 by 2018. Local small businesses and small non-profits will have 5 to 7 years to phase in the minimum wage to $15, and will reach parity with big businesses in 2025. After all businesses have phased-in the minimum wage, the minimum wage standard will be equivalent to roughly $14.30 in 2015 dollars. 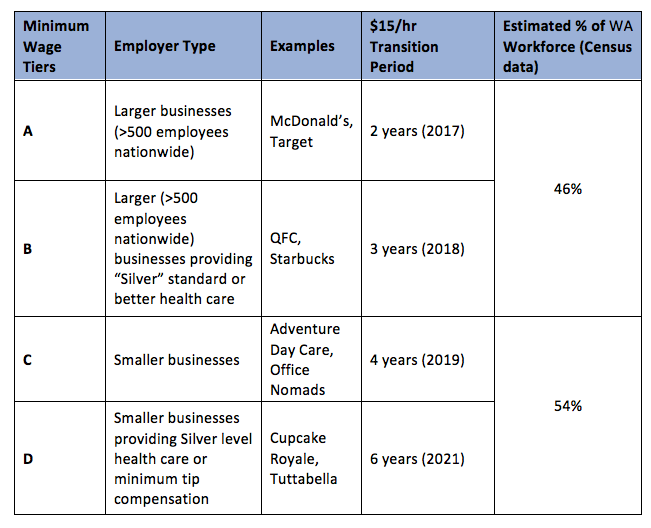 The Mayor’s proposal phases in the minimum wage in four separate tiers: A, B, C, D. As of January 1, 2015, the minimum wage for most businesses in Seattle will be $11/hr. The minimum wage standard will be tied to inflation starting on January 1, 2018. 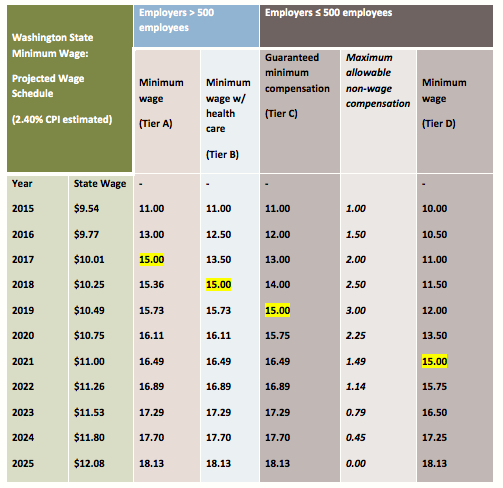 By the end of 2025, all businesses in the Seattle will pay the same exact minimum wage: an estimated $18.13/hr with a 2.4% adjustment for inflation. Who Will Benefit from the Mayor’s Income Inequality Proposal (And When)? Who will see a wage increase, and when, depends entirely on who you work for and what types of benefits you receive. Combining government data with a report produced by the Center for Economic and Policy Research, we estimate that nearly half of Seattle’s 102,000 work for large businesses, and 26% receive health-care coverage. For exact breakdowns of workers for each tier of minimum-wage phase in, see Table 3. How much more money will workers earn? Over the next 10 years, low-wage workers will earn nearly $3 billion dollars more than their current wages (assuming current wages rose in line with inflation). Our recent report shows that Seattle’s low-wage workforce earns an average of $11.95 per hour and works roughly 32 hours per week. We estimated their new earnings based on the difference between the proposed minimum wage and the current average wage of a workers making less than $15 an hour. The table below shows that how much more in earnings workers affected by the policy will make in each year of the phase-in. For example in 2017, when large businesses who do not provide health insurance reach $15 per hour low wage workers will earn nearly 150 million more in 2017, than if their wages had only increased with inflation. Over the 10 year phase-in period, the cumulative earnings for affected workers would be $2.9 billion dollars. 1 Our recent report showed that roughly 102,000 workers earn below $15 an hour. Using Economic Census data to estimate that 46% of workers are employed by large businesses with more than 500 employees anywhere in the nation. A national report, from the Center for Economic and Policy Research, indicates that only 26% of low wage workers receive healthcare coverage, and our own analysis of Census MicroPUMS data indicates that there are nearly 10,000 tipped workers in Seattle. Categories: Living Wage Jobs, Racial Justice, Uncategorized | Tags: $15, income, inequality, low wage workers, minimum wage, Seattle, wages | Permalink.